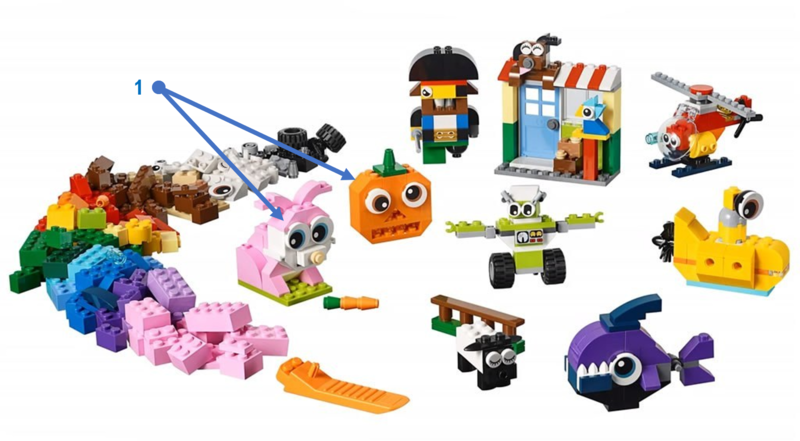 Most of the sets that will be released in January 2019 have been revealed, ranging from Classic brick boxes to interesting sets based upon The LEGO Movie 2: The Second Part. As usual, these sets contain an impressive selection of new elements, some of which serve a purely cosmetic role while others appear to be more versatile. Searching these images has revealed numerous such pieces and you can view them after the break. This article will be updated should any additional new parts emerge. Please be aware that we have not mentioned every new minifigure component, most of which appear in The LEGO Movie 2: The Second Part range, but have instead focused primarily upon more versatile pieces. 1. Two new 2x2 round tiles decorated with eyes have been introduced here. 1. A large pickaxe accessory. 2. A large sword accessory. 3. A large bow accessory. 4. A new 2x2 tile with a vertical 1x2 plate bracket. 5. This parrot features a new head. 6. 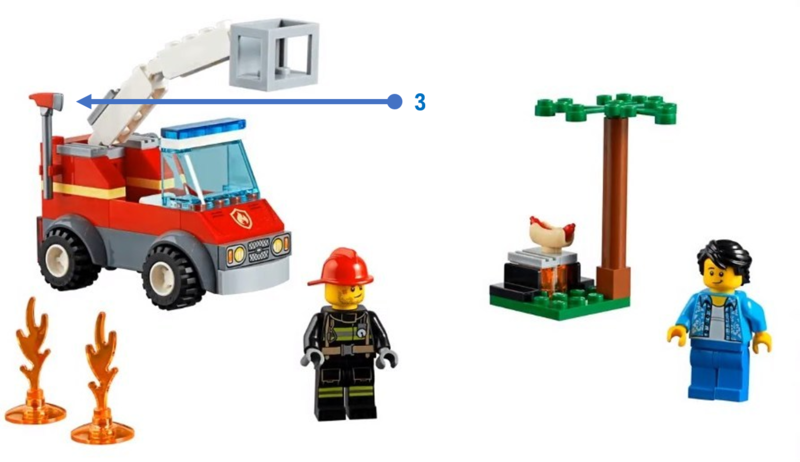 A new fire component which fits around minifigure legs. 1. A new curved 3x3 railing, corresponding with the existing 1x4 element. 2. This wavy panel was introduced in 70922 Joker Manor but is appearing for the second time here. 3. A new bird component. 1. A new heart-shaped 6x6 plate. 1. A new pair of trans-light blue goggles. 2. A new oxygen mask component. 3. A new fire axe. 4. Lights and sounds have returned in 2019 and this siren appears in several new sets. 5. This shooter component fires a series of 1x1 round tiles. 6. This large element launches a new kind of projectile using an air pump system. 1. These new spinner elements bear a closer resemblance to onscreen Spinjitzu than the original Spinjitzu spinners. 2. The two components which make up the dragon's head are both new. 3. New ninja head wraps have been introduced for 2019. 1. A new 3x3 dome element. 2. A new 2x2 inverted cone. 3. A new tyre component. 4. Several elements appear in a new colour, known as Vibrant Coral. 5. A new 1x1 curved slope. 6. Amber wears an enormous hair piece which is larger than the existing afro. 7. This star element is new and a similar heart piece appears in several other sets. 8. A new heart-shaped 1x1 tile. 1. A new decorative wheel cover. 2. The 1967 Mini Cooper S Rally includes a new wheel arch. 1. A brand new large sprocket. 1. A new gun component which appears in almost every Overwatch set. 2. A new shoulder armour component. 3. A new wedge slope element. Let us know if you think we have missed any other new elements in the comments. Which pieces are you most excited about? I think the Ninjago masks look new upon closer inspection. Friends: 1. A new heart-shaped 6x6 plate: I think this is a 4x4 plate with two 2x4 half-curved plates at the adjacent sides. City: 3. 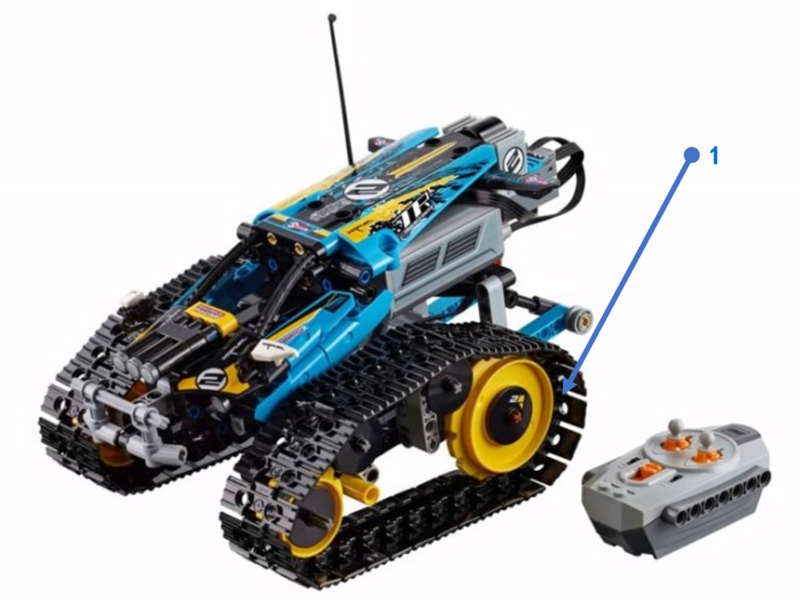 A new radio control accessory: Is this not just the old walkie-talkie with a 2x2 tile on it? Lego Movie 2: 6. Amber wears an enormous new hair piece: Looks like the hair piece that has been used for the clown and the disco dude and diva from the collectible minifigures. The color is new though. I think that the connection of the animal leg to feet from the Minecraft Maxi-figures is also new: 2x2 tile with a vertical 1x2 plate in one piece. In Minecraft, there's a new bracket with a 1x2 plate affixed perpendicularly to the center of a 2x2 tile. You can see it best as the feet of the parrot and chicken, but it is used for some of the other figures as well. The railing in the Disney sets is actually 3x3x2, not 4x4. 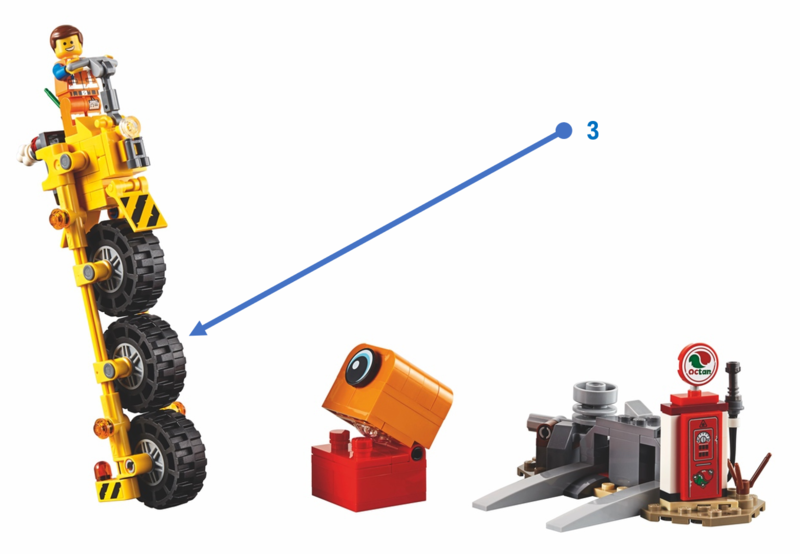 In Ninjago and The Lego Movie 2, there's a new system of "gear plates" in 4x4, 6x6, and 8x8 sizes. Look for it in the Monastery and the interior of the Party Bus. -There is no 1x1 new eyes on pic - the 0 looking one was in small red box from 2017, Deep Sea Creatures has new 1x1 eye for a SHARK! -Minecraft figures have weird new plates with plates - look at the chicken legs. Characters also use them to stand. Garbage Truck from City has ORANGE dumptrack bucket piece - Great for Powerminers fans! Queen Watevra has new CROWN! Lego movie heart from Escape Buggy! - It's back seems to be a whole new mold. 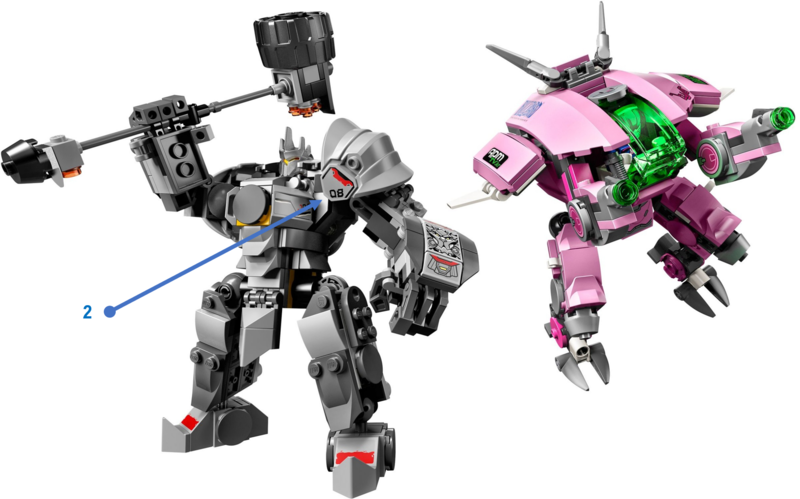 Battle-Ready Batman and MetalBeard - Batman gets new armor as well the warrior has one side only spiky armor. Juniorized TIE FIGHTER from TIE Fighter Attack has single piece TIE wing pieces. Whole Overwatch line has new great gun piece. #4 in Minecraft... perfect for all your heretic burning needs...? WHAT ABOUT THE CITY PARACHUTE!!!!!!!!!!! And over watch has some sort of new slope piece on the gibraltar ship. Here is what I found: The eyeprint on the micro dewback looks new. A whole bunch of large pieces on the juniors star wars. Also a recolor of the CMF stand in the Ferrari Speed Champions set. Great article, but you're missing a lot from Overwatch. :-) I can spot a new gun piece in multiple colors, many new hair / helmet elements, the Winston bigfig, slopes in 75975, roller coaster tracks in red, and possibly more. I think there's a new 3x3 corner plate on the top of 41367 holding the golden horseshoe - also visible from the back on the back box picture. The TECHNIC Porsche has new wheel arches (so does the Corvette). The tracked racer has a new sprocket wheel. Thanks everyone. I have made some alterations and additions and will continue to update the article shortly. 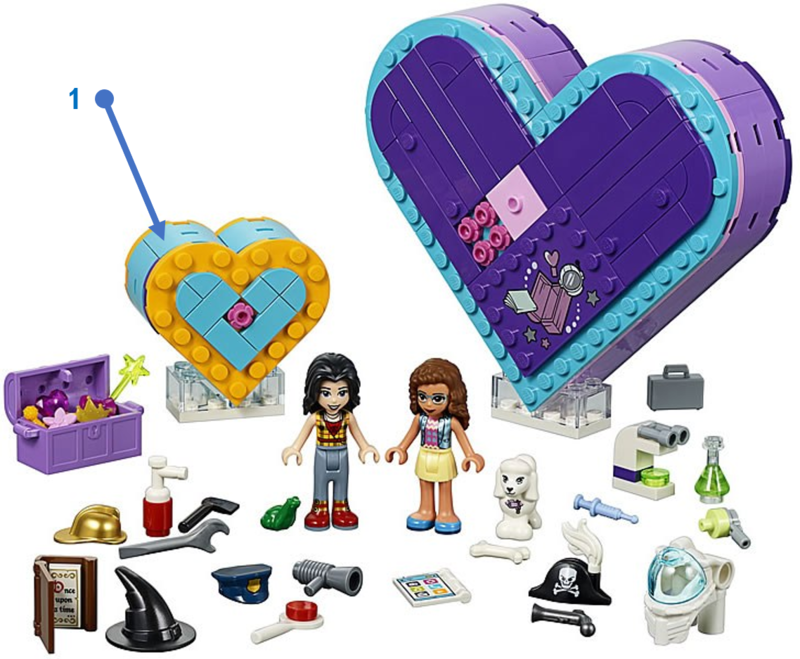 @Hawkguy - Alternative images of 41359 Heart Box Friendship Pack show the heart-shaped 6x6 plate more clearly and the pink hair piece is much larger than the original afro element. @TheBrickPal - As mentioned in the article, I have omitted the majority of minifigure pieces with a view to focusing upon more versatile elements. Thanks for the suggestion though. Some of these look really interesting (the piece on the legs of the minecraft birds in particular), while others seem unnecisary. I'm also a little disapointed the Minecraft bigfig weapons are not brick built. Thanks for the interesting arcticle! Are the white safety bars inside the Camaro a new part? - awesome new wing pieces on General Mayhem! - new mudguards in MINI Cooper set and maybe new piece in the lights of Mclaren Senna? This pieces feel a bit redundant, honestly. I'm all for versatile new pieces, but none of these seem well thought-out. 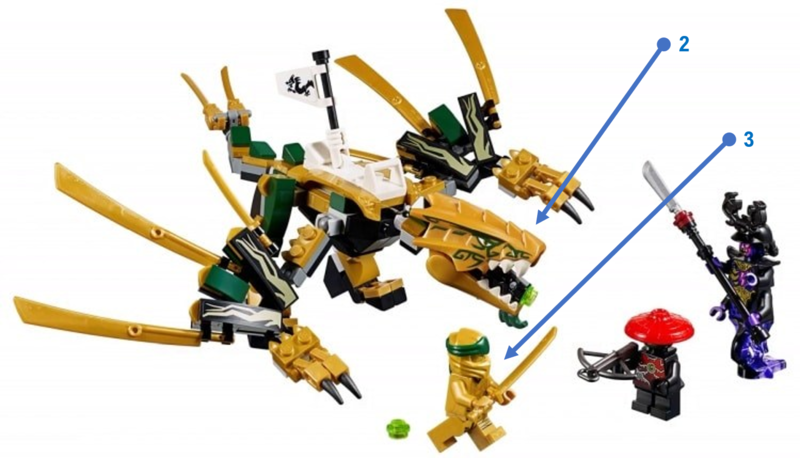 @lordofdragonss: The shark eye in #31088-1 is not actually a new printed piece, it's a black Technic pin with a 1x1 Technic beam/bushing around the outside and a lightsaber blade through the center. @CapnRex101, if you're not talking about the crab eyes which originated in the Red Creativity Box, which new printed 1x1 tiles are you referring to? Also, the air pump powered water cannon is seemingly not a projectile, but more of a transparent light blue "battering ram" that extends and retracts without actually firing out of the cannon entirely. Many of the new Ninjago sets have a brick-built tool with what seem to be two new elements: a Technic cross axle with a 2x2 diameter clip, which holds some type of new 2x2 turntable-ish part.You attach either a minifigure or a Spinjitzu tornado to the top, and by rolling the bottom edge of the turntable-ish part along the ground, they will rotate so that they can swing their weapons at each other. #41365-1 has a textile element that patterns appear on when water is applied. Ultrakatty, of course, has 1x5x2 bricks as her face. Now that most of the new Lego sets for January 2019 have been released, what about the 3 Jurassic World sets for 2019? Pictures of those have not been released yet. I don't think that the new Minecraft bracket has a vertical 2x2 plate, the parrot shows a 1x2 plate. In the golden ninja set, I'm pretty sure that the stone warrior's red hat is new. The older ones had hats like Wu's. The one in the picture looks a little rounder. I think there are more in Speed Champions. I don't recognise the air intake on the Dodge Challenger. Then the McLaren Senna might have new parts for the headlights, and a triangular 2x2 tile for the rear wing endplates. 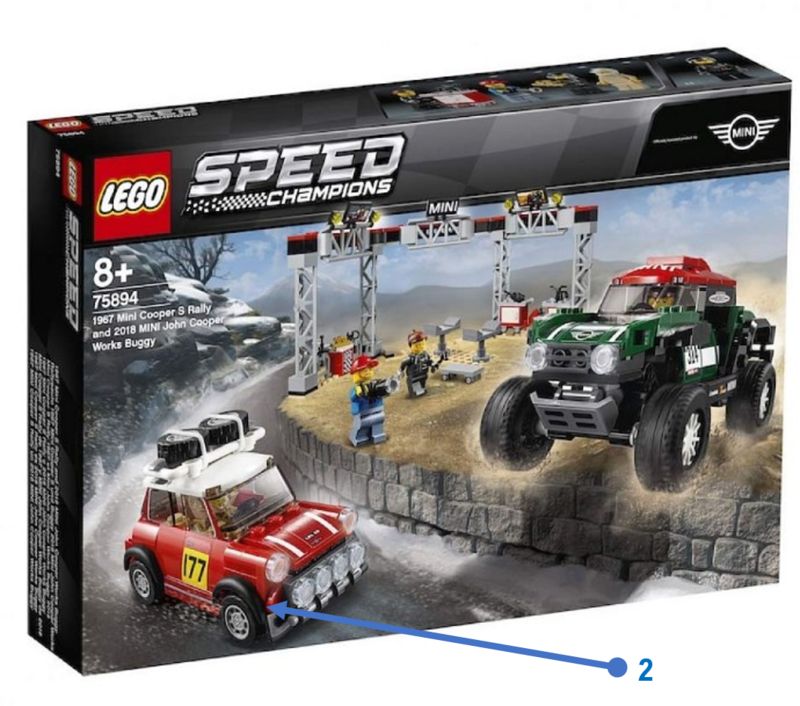 Another piece to note with the Speed Champions range is the new mudguard piece on the 60's Mini Cooper S.
Can’t wait, although most of these pieces seem like they have only one use. Although not new, the molded lion head Brick is back in the largest fire set! Check out the blue oxygen pack on the fire fighters. Haven't seen that one since the classic space theme!! ^ First off, what a knock off name... and although I say welcome to the community, as it seems to be your first day, you could have picked something a little more "original" might I say. And as to your comment, you clearly did not watch the Lego movie, as Benny clearly has the same piece. ^ If you are to believe that you are so significant as to have influenced my name picking, you are sorely mistaken. I for one have not even seen your name on the comments before now. But regarding the oxygen pack, I do stand corrected, and thank you for your "gentle" reminder. I hope against all odds we see the 3x3 dome printed as an astromech head some day. Its the perfect size for the UCS X-wing, 2x2 is way too small and 4x4 is way too big. Super hyped for the coral colour, Ive been needing something in that area. That pilot is awesome! I'm gonna have to track down several for the collection. It's just too good! @CapnRex101: Really? Which theme? I hadn't noticed it in any sets before now. I'm talking about the 1x6x7 one with the columns and the semicircular arch (like in the ground floor of the pictured Disney set), in case you thought I was referring to the 2x6x6 one with the gothic arch and curved walls (used on the top floor near the balcony). Also, you still haven't added those exciting new gear plates—they're most visible on the back of box pic for the Pop-Up Party Bus (in the 4x4 and 8x8 varieties), as the Medium Lilac and Vibrant Coral rotating platforms on the inside of the bus. The 6x6 variety appears in Dark Stone Grey in the Monastery of Spinjitzu, as the trap floor connected to the rotating wall, left of the central tea room. 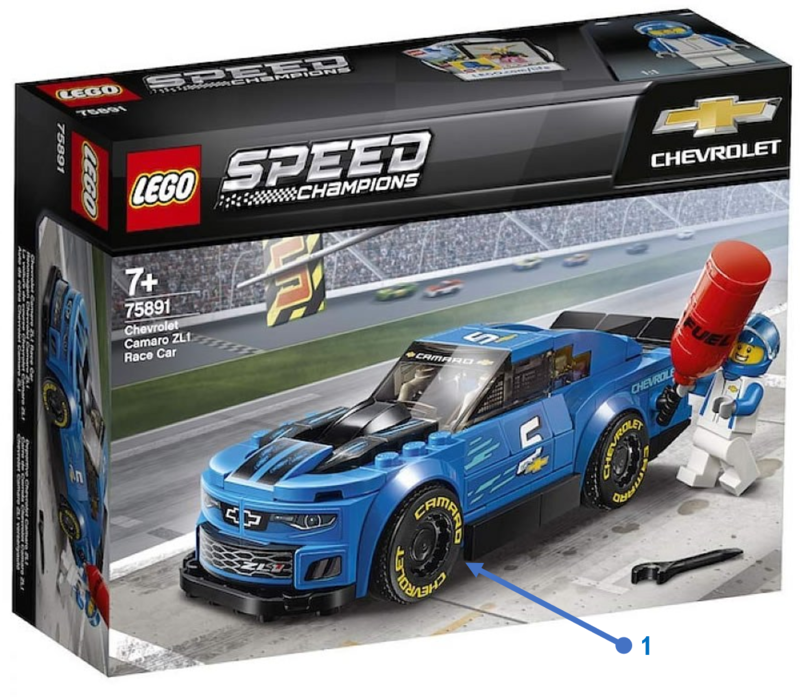 -I think the front wheel of 70834 is new? 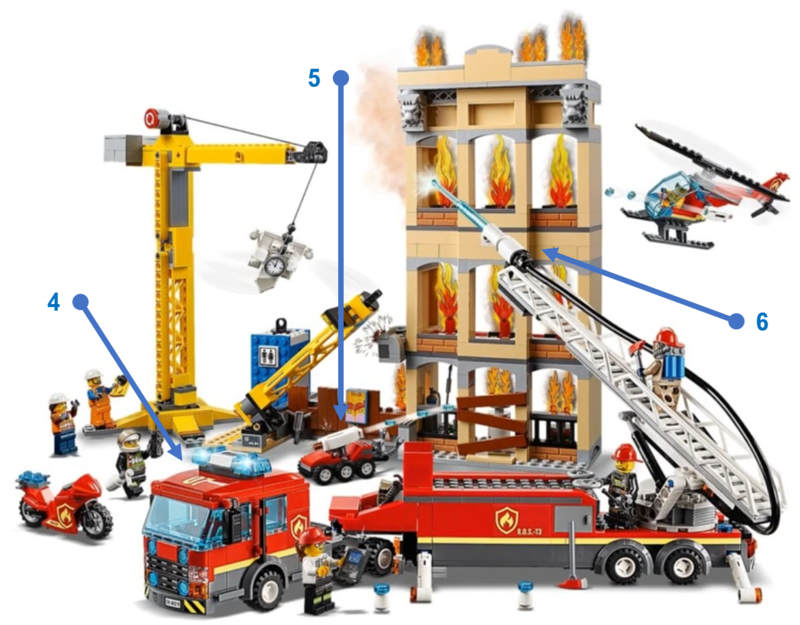 The cool functioning pieces of the Lego City Fire Truck and Flaming Building may make it my first day one purchase! 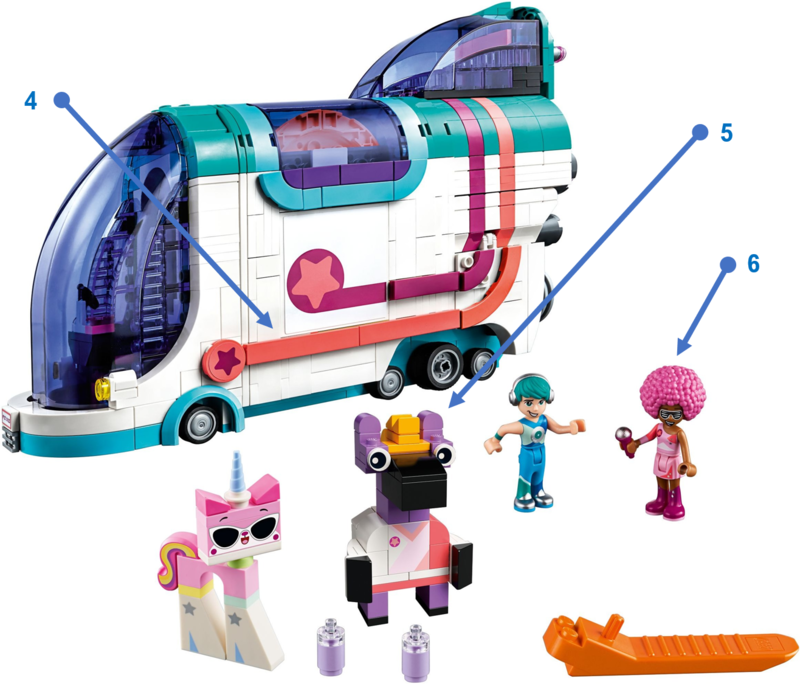 The 5-wide, 2-high brick used for Unikitty's face in 70827 ought to be new too, right? I find it funny that, whenever someone asks for a simple recoulor of a part someone else comes along saying with total certainty that it has to do with costs, when it's clearly that they have no idea of what they are talking about. 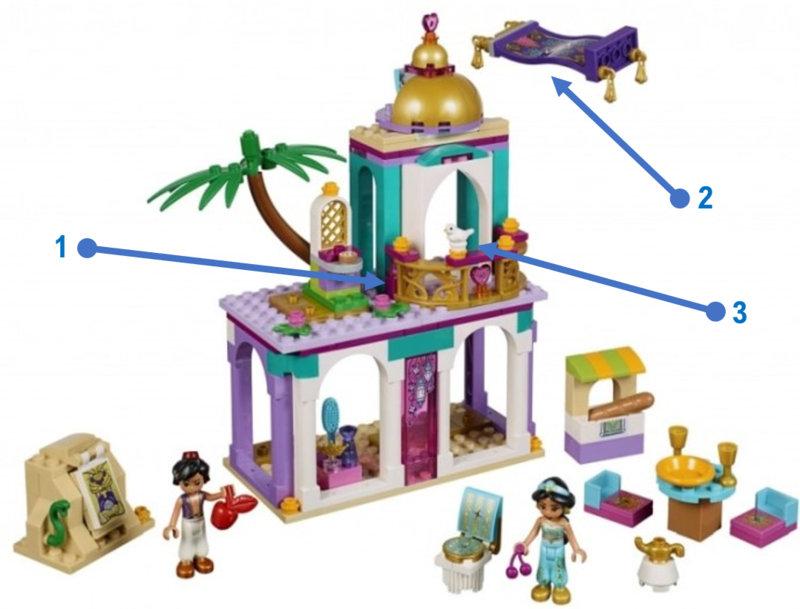 Are those archways in the bottom part of the Alladin set new`? They are different from the curved wall/portal piece in this year's Disney sets.. Here's hoping we get more cylindrical/curved pieces at different scales in the future. That new dome is a good start. @firestar246: It's a new recolor, but the mold itself is https://brickset.com/parts/design-98834 (introduced 2017). 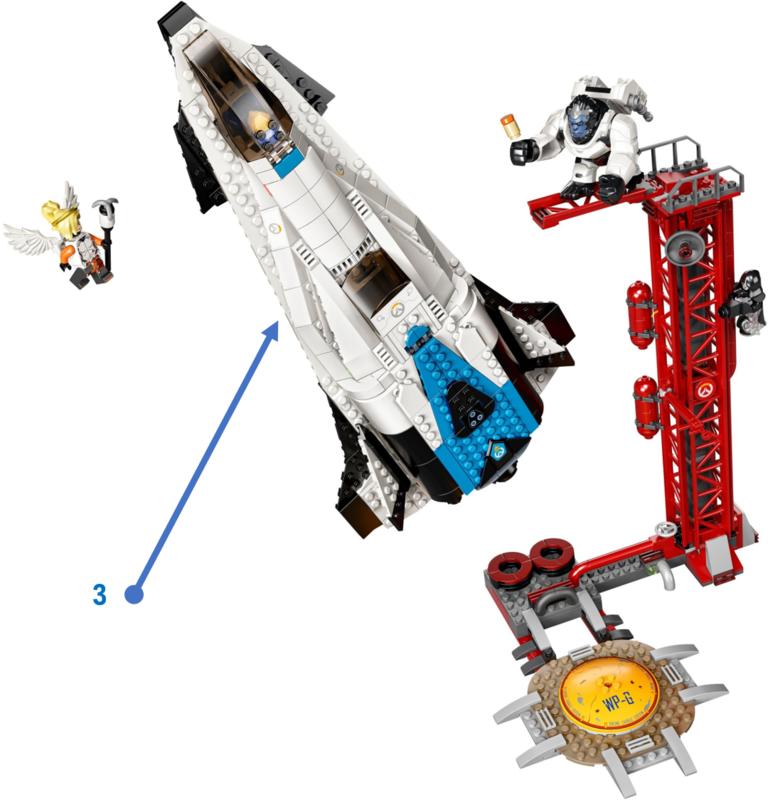 @PM0nty: The air intake on the Challenger appears to be https://brickset.com/parts/design-98834 (introduced 2012). The McLaren Senna headlights are a particularly creative use of https://brickset.com/parts/design-22407 (introduced 2016). 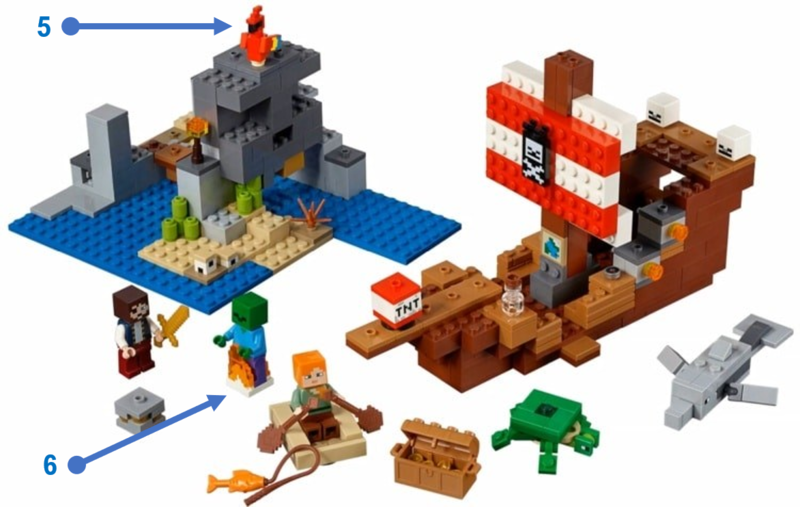 The triangular 2x2 tile is https://brickset.com/parts/design-35787 (introduced this year). @galante: I don't think it's really fair to say that. Just because LEGO makes lots of new molds, prints, and recolors doesn't mean they can afford to introduce as many as they could possibly want. Usually, people saying that a recolor has probably been omitted for cost reasons aren't saying LEGO can't afford to recolor that one part — just that to do so, that recolor might have to take the place of one of the other, potentially more important recolors or other new elements in that set/theme. The new fire axe looks like a genuine mean tool and I love the Minicooper S Rally. @galante: Recolours are absolutely a cost thing, hence why designers are limited in how many they can use. That much can be easily gained from various interviews and statements made by designers. There can be other factors too of course: The small ball joints have only been made in grey so far because they have some of the tightest tolerances of all current Lego parts. Different colours have minutely different properties, which could affect the fit over time, and so far they've only done the relevant extensive testing for light and dark grey. What about from the Chinese new year sets? I have read that the food tiles are all printed, and there may be other new pieces as well. @DeluxeBrix: They are, but each of them does feature a new part that makes up the "core" of the weapon shape. What about the stop sign part as Lucy’s shield? That appears to be less a new arch and more an old windscreen w/ printed deco. It looks exactly the right size to be 62360 from the Speed Racer theme, which is now ten years old. Also, the Classic Space helmet is absolutely new. It has an even thicker chinstrap (making it the fourth iteration, if you include Benny's broken-chinstrap design), so these will be the only three colors for that helmet when that set is released. 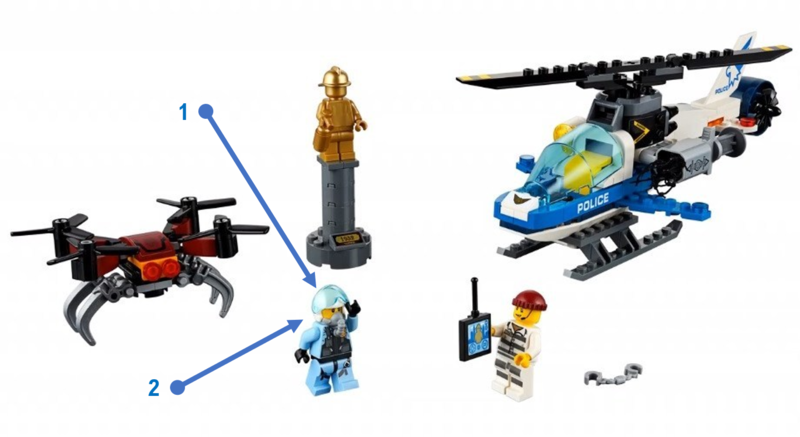 There's a new helicopter blade-styled piece used for fins on Cole's Earth Driller (70669). There may be new shortsword elements used in Monastery Training (70680), but I'm probably mistaking them for elements introduced in the Hunted series. 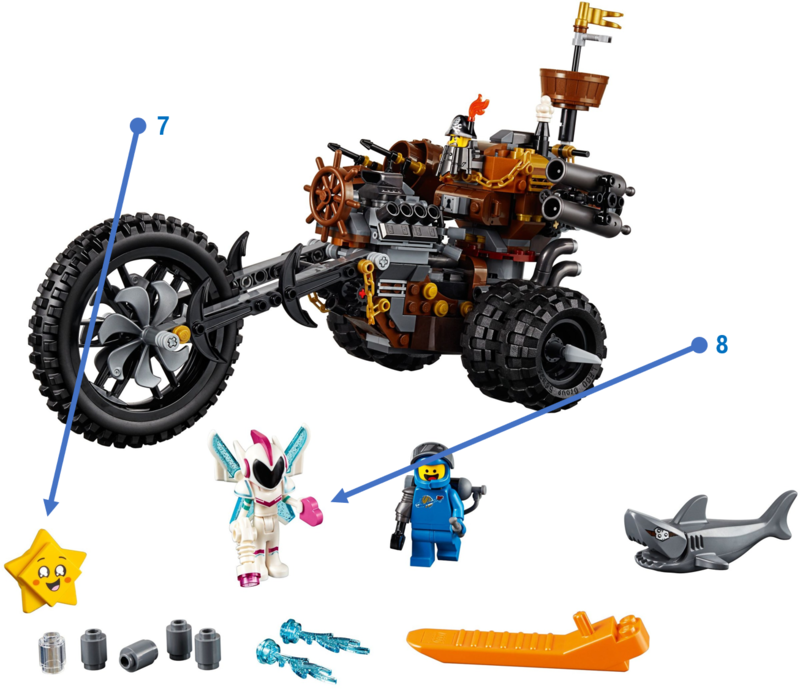 @jimbo4274: That blade came out this year in black in the Ninjago "Sons of Garmadon" and "Hunted" waves, but the Earth Driller will be its first appearance in Warm Gold. On a similar note, 70680 Monastery Training features the weapon pre-pack from the "Hunted" wave in Warm Gold for the first time. It just occurred to me that LEGO missed the opportunity to make the Twin-Pod Cloud Car from the new Cloud City set in Vibrant Coral.